Pittsburgh Steelers athletic trainer Sonia Gysland with Tom Kaminski (left) and members of the UD Student Athletic Trainers Club. Pittsburgh Steelers athletic trainer Sonia Gysland addresses members of the UD Student Athletic Trainers Club. 10:38 a.m., April 15, 2013--Sonia Gysland isn’t offended when people question her suitability as an athletic trainer (AT) in the NFL. 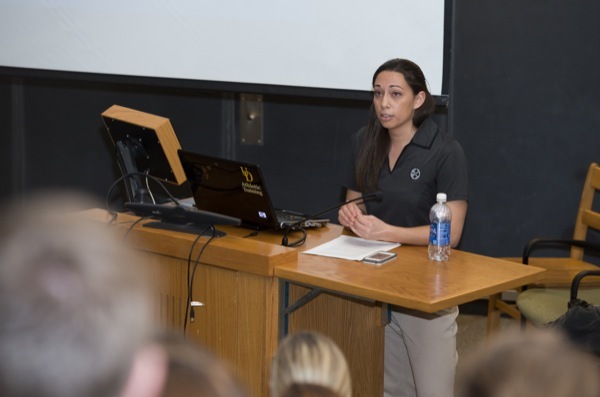 “I thrive on people doubting my abilities as a female,” she told an audience of more than 75 athletic training students at the University of Delaware on Thursday evening, April 11. The University of Delaware's Nii Attoh-Okine recently published a new book with Cambridge University Press, "Resilience Engineering: Models and Analysis." UD ROTC cadets will run from New York City to Miami this month to raise awareness about veterans' affairs. She began the story of her personal journey by crediting other pioneers who paved the way for minorities in professional sports, beginning with Ronnie Barnes, an African-American who was named head trainer of the NFL’s New York Giants in 1980. Gysland herself learned at an early age that hard work pays off. After losing all of her races in her inaugural track season as a fourth grader, she began to run more seriously  and never lost another race again. Gysland cited five key traits for success in athletic training: tolerance, mental toughness, work ethic, physical fitness, and professionalism. She also shared with the students her typical day as a trainer in the NFL, as well as the team’s monthly and year-round schedules. Although the NFL season is only 17 weeks long, the remainder of the year is filled with post-season surgeries and rehab, camps, physicals, off-season conditioning, the draft, and a variety of other activities. There is little downtime for trainers in this world. Tom Kaminski, professor of kinesiology and applied physiology and director of Athletic Training Education at UD, has witnessed a surge in female students in the program over the past several years. “It was great for all of them to hear Sonia’s story about her rise to a prominent position in a male-dominated sports world,” he said. 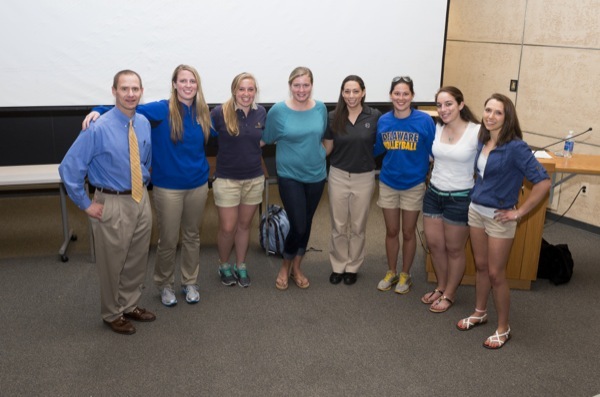 Gysland’s visit was sponsored by the UD Student Athletic Trainers Club.